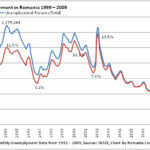 Employment and the unemployment rate in Romania is hard to understand if not related to the general employment structure and other labor market indicators such as the occupation and activity rate or the role of (short term) migration. Even during the hard recession of the nineties and their aftermath official unemployment rates in Romania were relatively low when compared to other Eastern European countries. The answer is to be found in a sharp decline of the activity rate (as low as some 65%) and a large share of the agricultural sector of the employment structure in Romania. The agricultural sector, thus, served as a buffer, but should been seen better as a form of hidden unemployment. If we focus on the amount of job destruction after 1990 we can conclude that some 2.5 million of jobs were destroyed until 2005, what is still an equivalent of over 10 % of the total population or nearly 23 % of the working population from 1990. The labor market recovered somewhat later as GDP recovery might suggest and a relaxation of the labor market in Romania started beginning in 2004-2005. This having said, we can enjoy a look on unemployment rates and conclude that unemployment had been in a sharp decline after 2002 until the outbreak of the financial crisis. More than that, after 2005 the Romanian labor market, at least for skilled labor in economic centers, was far from being crowded but characterized by a surging demand for labor supply and sharp competition for labor among enterprises. In some economic centers such as Bucharest one might even be tempted to speak of full employment. However, beginning with early 2009 crisis set an abrupt end to the decline in unemployment rates and reversed the trend completely. The yearly average of unemployment in Romania raised to 8.4 % as estimated by the CNP (or 6.6 % as reported by INSSE, vs 3.7 the year before, Figure 1) while a full recovery will not happen according to the forecasts in the next years (table below).